Green All Over: Leading Bookmakers? 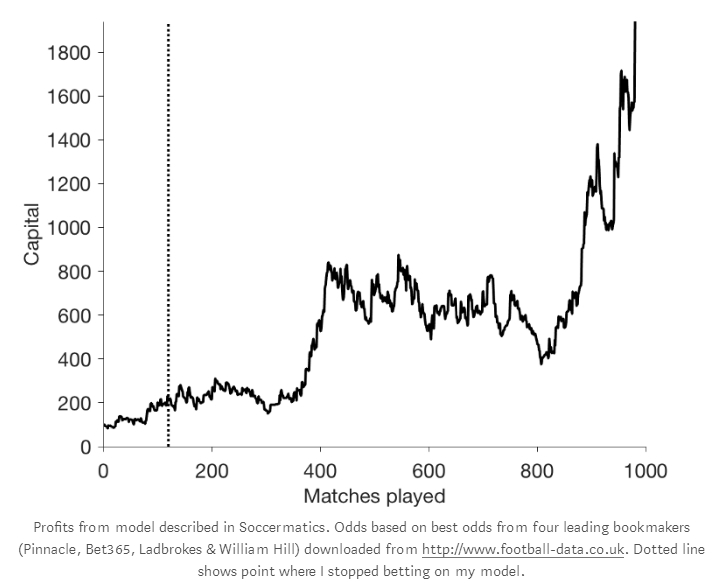 Note the explanation that: "Odds based on best odds from four leading bookmakers (Pinnacle, Bet365, Ladbrokes & William Hill)". When it comes to Ladbrokes and William Hill, the term 'leading' can most certainly not be applied in the sense that these firms offer 'leading' prices. This is very mis-leading. As many readers will know, the Draw has long been of interest to me, and I keep track of these things. Going back to the start of the 2012-13 season, there have been a total of 2,210 English Premier League matches. William Hill offered the clear best price 10 times, while Ladbrokes were hardly much better with a count of 18. Bet365 were the best price in 327 matches, but far and away the best book, and one won't restrict you, is our friend Pinnacle. Pinnacle's early Draw price was the outright best 670 times, with their closing price on top 934 times. Pinnacle's early and closing prices were joint best in another 36 matches, and overall Pinnacle were best or joint best priced in 81.5% of matches. As for backing the draw in Draw-4 matches (no team is odds-on to win, and the draw is under 4.0) the profit is 83.42 points from 944 matches, an ROI of 8.8%. In all 167 matches between the Big 6, the profit is 28.73 points, an ROI of 17.2%. Adding my Draw-4 filter improves this to 29.46 points from 119 matches, an ROI of 21.0%. Backing the Draw in every game would have lost you just 24.02 points, an ROI of -1.1%. The results of the 2,210 games were Home Wins 45%, Away Wins 30%, Draw 25%. Remind me in May to update at the end of the current season.